BANGI, 22 September 2010 – Universiti Kebangsaan Malaysia (UKM) yesterday launched its new school community programme, CRYSTal (Creative YouthS Through Innovative Learning) involving three secondary schools in Bangi as part of a more concerted effort to promote innovation and creativity among school students. The programme is sponsored by the Malaysian Technology Development Corporation (MTDC) and organised together with the Ministry of Education. UKM students act as mentors to three groups of students from Sekolah Menengah Kebangsaan Jalan Tiga, Bandar Baru Bangi; Sekolah Menengah Teknik Kajang and Sekolah Menengah Jalan Bukit, Kajang. MTDC gave RM189,460 to sponsor the programme. UKM designed the training modules particularly in programming micro-chips as well as organising courses for teachers and students. Micro-controller chip used in the project is easily programmed by connecting it to the computer enabling it to perform various functions automatically. Some UKM lecturers have been inducted as advisors and help train the mentors and built the training modules. Speaking on behalf of the UKM Vice Chancellor when launching the programme at SMK Jalan Tiga, here yesterday, Deputy Vice Chancellor (Academic and International Affairs) UKM, Prof Dato’ Ir. 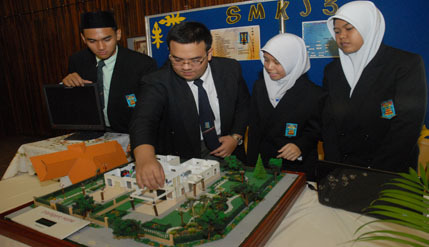 Dr. Hassan Basri said the programme is a good example of the varsity’s involvement in community programmes through the Faculty of Engineering and Built Environment and the Faculty of Information Science and Technology. “Through the project UKM students became mentors helping the students to be more innovative and encouraging them to be creative. “Besides training our students to understand the needs of society, the programme also equipped them with the skills that may help them in the future,” he said. In line with this, UKM plans to give its students involved in such communal activities credit for curriculum and co-curriculum activities. Prof Hassan said apart from being involved in such local programmes it is also taking part at the international level by being a member of The Talloires Network which has a membership of more than 200 institutions of higher learning committed to civics and social activities. “With this membership UKM signed a declaration to apply academic skills in the university for the benefit of society,” he said. Prof Hassan said UKM had also been involved in helping flood victims in Pagoh, Muar in 2007 and adopted Kampung Kundang Ulu where research and educational programmes were held. It had recently successfully organised an intervention project ‘Kem Perkasa Remaja’ to help rehabilitate wayward youths involved in illegal motorcycle racing. Under the CRYSTaL project, students from SMT Kajang, created an Intelligent Traffic Light signals to help pedestrians cross roads. Traffic lights were installed with sensors which regulated the signals accordingly. Students from SMK Jalan Tiga, Bangi built an Intelligent Home sensors to help manage electrical supplies for most of the electrical appliances in homes. The third group of students from SM Jalan Bukit, Kajang developed sensors used in cars that can help to avoid collision named the Non-Collision. A pioneer project similar to CRYSTaL was organised by UKM with United Engineers Malaysia (UEM) called Smart Programme involving SMK Nusajaya and SMK Sultan Abu Bakar in Johore a few years ago. Among the applications successfully developed by students from the two schools were ways to save electricity used in the laboratory and class rooms, queues at school canteens and helping farmers manage their coops for ducks.